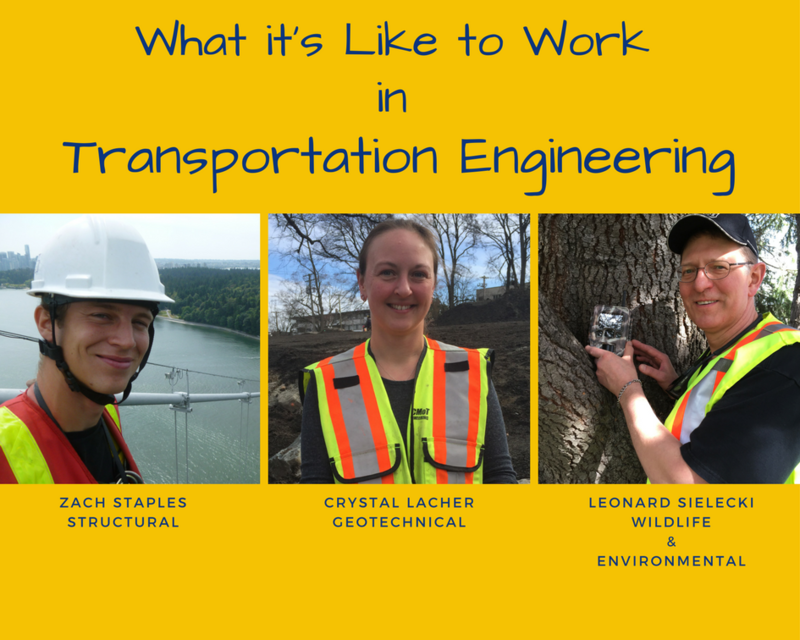 In Part 1 of our interview series, we introduced you to a traffic and safety engineer, an electrical engineer, and a highway design engineer. It’s time to round out our engineering team by getting to know what it’s like to work up high, down low, and where the wild things are. 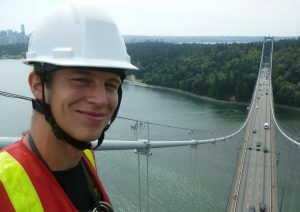 That’s right, today we talk to those who work with bridges, earth materials and wildlife. As part of the Structural Asset Management Group, we are responsible for upgrading and maintaining the bridges, culverts, and retaining walls found in the highway network. This includes working in multidisciplinary teams made up of ministry staff, consultants, stakeholders, and contractors to develop projects that help ensure the continued safety and fiscal responsibility of the structural network. What would BC highways look like without structural engineers? While driving along highways, people typically don’t consider hopping out of their cars to determine if crossing a bridge is safe. They carry on, driving at highway speeds, as if they are on any other stretch of highway, even though they may be suspended 50 metres above a valley bottom or crossing over the Fraser River. This carefree attitude would not be possible without the work of structural engineers and technicians when it comes to designing, constructing, and maintaining the bridges, culverts, and retaining walls that help form our transportation network. I’ve had the opportunity to work on the construction of a new stretch of highway, which included several bridges, culverts, and retaining walls. From my experience, the most satisfying part of the work is utilizing the infrastructure that you helped create, and witness the benefit that the travelling public gets to experience because of the changes you helped deliver. Upgrading and maintaining structural assets is a very expensive aspect of owning a highway network, as we often see enhancements costing millions of dollars. The most challenging part of working with structures that I’ve experienced is determining the best way to spend taxpayers’ dollars to achieve the best value when it comes to maintaining and upgrading our diverse structural network, as this requires a thorough understanding of structural behaviour, structural materials, and financial considerations. I’m very interested in hydrotechnical and geotechnical engineering. These disciplines have a different set of challenges than I’ve experienced in my work with structures. A simplified definition of a geotechnical engineer is an expert in the behavior of earth materials (i.e. rock or soil). Types of projects that a geotechnical engineer with the ministry could be involved with include material characterization, designing of structures (bridge or culvert foundations, retaining walls), slope stabilization (landslides, rock falls), roadways/highways designs (widening or re-alignment), and ground improvement (settlement, soft soils). What would BC highways look like without geotechnical engineers? It would be like having a bridge without steel or concrete. Nearly every aspect of BC highways requires earth materials in some shape or form. The most satisfying part of my job is getting to be involved in a wide variety of project types and being able to work with all the other engineering disciplines, as geotechnical engineering is always needed in some form. It’s also satisfying when I get to see my engineering designs constructed. When I reflect over the 12 years of my career, two things jump out at me: One, the first time I got to go up in a helicopter to view a rock fall that had occurred in the Kelowna area, and two, realizing that I get to explore areas of the province most individuals generally don’t. There are a number of challenges in being a geotechnical engineer. For me, the most challenging aspect of my work is the fact that earth materials (soil and rock) aren’t traditional. No two projects will ever have the same soil or rock type, and even if two sites do have a similar soil type – two clay sites, for example – the characteristics of that soil are, more often than not, vastly different. I would shadow a colleague in structural engineering because bridges (and buildings) have always been a fascination to me. This discipline and subject area was always a favourite when I was obtaining my bachelor degree. Even when I’m travelling to a new destination, I find structures monopolize my photographs. 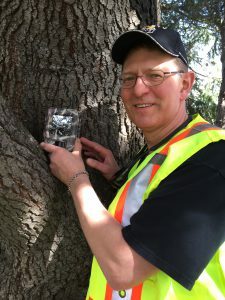 I am responsible for managing the ministry’s Wildlife Accident Reporting System to monitor wildlife-vehicle collisions and wildlife mortality on provincial highways. I also manage the ministry’s Wildlife Monitoring Program to find out how effective the ministry’s wildlife protection projects are working out. I am always working with my ministry’s engineering staff and wildlife experts at the Ministry of Forests Lands and Natural Resource Operations to develop more effective ways of protecting both wildlife and travellers. What would BC highways look like without wildlife management? Provincial highways would be far more dangerous for both wildlife and travellers. Some species, like badgers and woodland caribou, would be close to extinction. Knowing the work I do contributes, in part, to the protection and preservation of wildlife in the province. This is particularly important to me when working with threatened and endangered species of wildlife. Trying to understand how wild animals think and why they do what they do. I am always amazed by how wild animals can figure out ingenious ways to outwit humans. That’s a tough question. The engineers and geoscientists in my branch do incredibly interesting work to design safe highways and protect the motoring public. 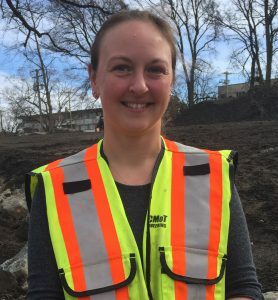 Since earthquakes occur in British Columbia, I would shadow one of the ministry’s seismic engineers to see how they make buildings and bridges more capable of withstanding earthquakes. Now, that you’ve heard from these talented people working in engineering, what discipline do you think sounds the most interesting? Do you have a question for them? We’d love to hear it – write us in the comments section below.